Pictured are representatives of ATC 1156 squadron and Stephen Brown, managing director at Staffvetting.com. 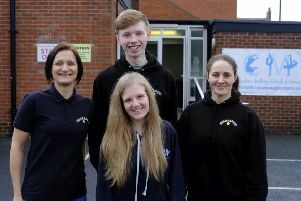 The RAF Air Cadet squadron that covers the area in and around Whitley Bay has received a funding boost. The £1,000 sponsorship from Staffvetting.com – a provider of quality staff vetting services – will help towards maintenance costs for a vehicle that is being used by the Air Training Corps (ATC) 1156 squadron. ATC provides numerous opportunities to young people between the ages of 12 and 20 and the normal operating numbers at the unit are between 20 and 30 cadets. In addition, cadets earn qualifications that are useful not only in military circumstances, but also in civil life. Steve Kirtley, Former Officer Commanding at the squadron, said: “We are delighted that Staffvetting.com has assisted in helping towards the cost of our vehicle.